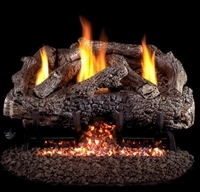 Choosing the correct Gas Log Set for your fireplace can be a very confusing process. Not only are there countless different brands to choose from but there are also a seemingly endless styles and variations. Our menu system will make this much easier. We will answer one question at a time which will lead you to the perfect log set for your application. 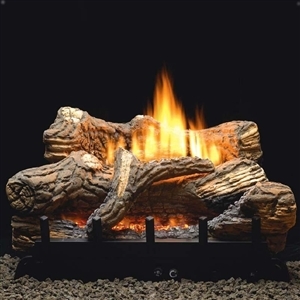 At Peddler's we have the best selection of gas logs that are the most reliable and durable logs around. 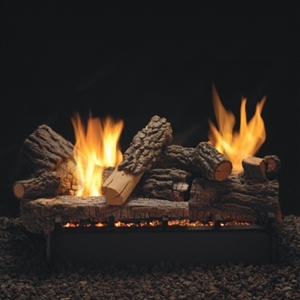 The first thing you need to determin is weather you need a vented or a non-vented log set. 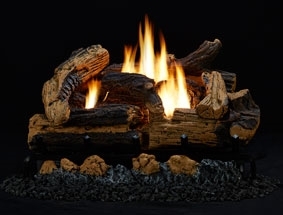 VENTED: A vented set of logs will be more realistic, it will have more flame and a full bed of glowing embers beneath the logs. 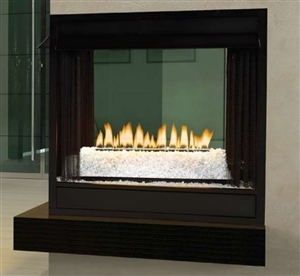 The vented logs can only be used in a fireplace complete with on open chimney so the emmisions can be vented safely out of your home. Now keep in mind that when you have an open chimney not only will you be venting the emmisions, you will also have some heat loss. The alternative to this is to install a non-vented log set. 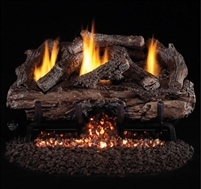 VENT-FREE: The Vent-Free Collection offers gas log sets that bring the splendor and warmth of a wood fire without the need for venting your fireplace. 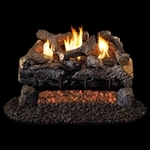 Hand crafted logs in a variety of styles, active natural flames and glowing embers magnify the beauty of your hearth. With 99% heating efficiency, these sets operate using less gas, saving your energy dollars. ANSI certified for natural gas or propane gas: the Vent-Free Collection is equipped with an Oxygen Depletion for safe operation. 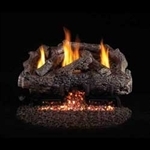 Our Vent-Free Collection is approved for use in a solid-fuel burning fireplace, certain universal approved vent-free fireplaces and specifically approved vent free fireplaces. Choose the Vented or Vent- Free sub category above and we will continue. 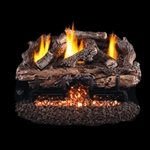 G10 Series Vent Free Triple Burner 24" or 30"
G18 Series 24" or 30"